Our Interchangeable Window Counter Mats offer cost-effective advertising solutions for retail stores, hospitals, schools, hardware and industrial parts outlets, offices - basically anywhere a counter top is used for purchases or a working surface. 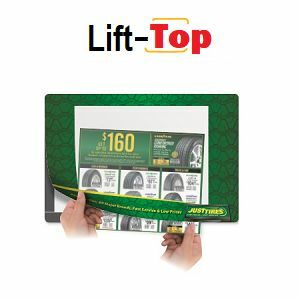 Lift-Top Window Mats and Slide-In Window Mats are the best solution for retail locations that need to regularly change display advertising messages. 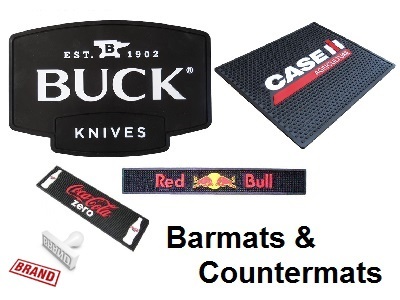 WindowMats.com offers the largest selection of Interchangeable Counter Top Mats. Point-of-purchase advertising with Window Counter Mats has proven effective at improving impulse buying and building brand awareness. We can customize Window Counter Mats with your company logo and ad message. Custom Window Counter Mats do their job right at the point of sale. Ready-to-ship Stock Mats are also available. 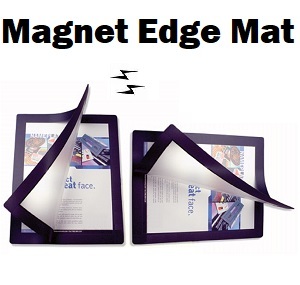 Promotional Counter Mats are used by the most successful consumer, business-to-business, service and industrial companies. Companies just like yours. With our premium Window Counter Mats, you get your customer's attention right at the point of purchase. Logo counter mats reinforce your company's branding image and promote your ad message, all while providing an essential function. 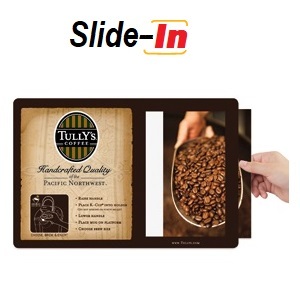 Complete your Point-Of-Purchase branding strategy with heavy duty counter mats and barmats. 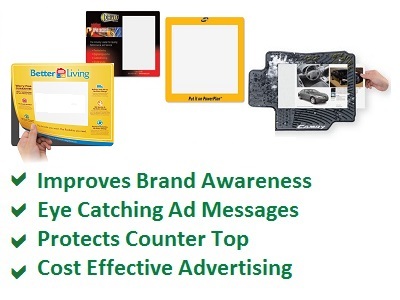 Clients will see your company logo and advertising message in plain sight at time of purchase. Perfect for retail stores, hotels, restaurants, & industrial suppliers. WindowMats.com offers a complete selection of interchangeable insert counter mats, insertable lift-top window mats, retail counter display poster mats, ultra-thin register counter top pads, and adhesive sign holder advertising change mats. WindowMats.com is an industry leader in the sale of interchangeable window countermats, insert counter top pads, custom printed counter mats, changeable poster point of purchase displays, company branded counter top mats, retail counter mats, counter protector mats, counter mats with inserts, counter mat material, desk window mats, economy counter top pads, ultra thin adhesive counter mats, plastic lift top counter mats, and slide it graphic counter mats. All trademarks and patents are the property of their respective owners. *Made in the USA where indicated. Global sourcing options available.